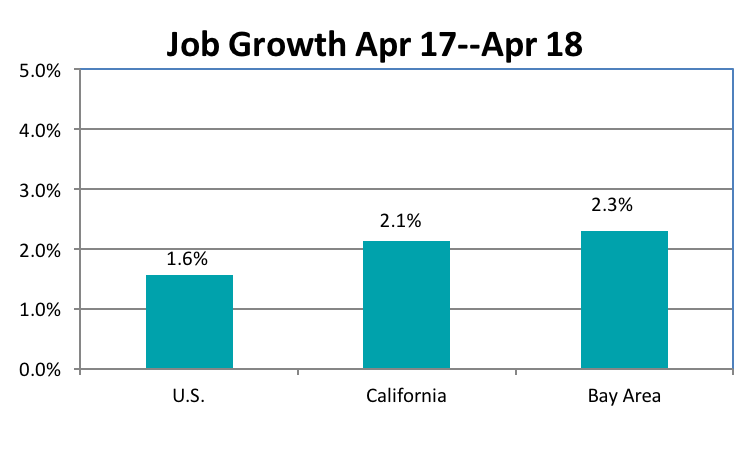 Bay Area job growth rebounded sharply in April reversing slower growth in the first three months of 2018. By April 2018 year over year job growth rebounded to 89,100 (2.3%) and the number of deals for additional office space continued strong even as current job growth paused. Low unemployment rates and slowing population growth raise questions as to where the workers will be found to ill the planned expansions in the region. 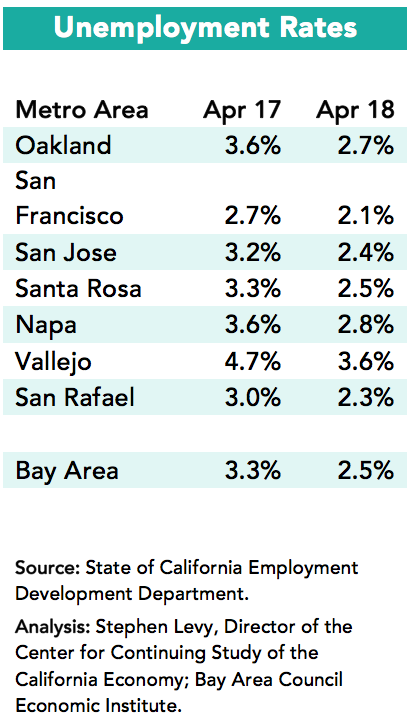 The Bay Area posted a 2.3% job growth rate during the past 12 months just above the state average and far above the 1.6% U.S. gain. 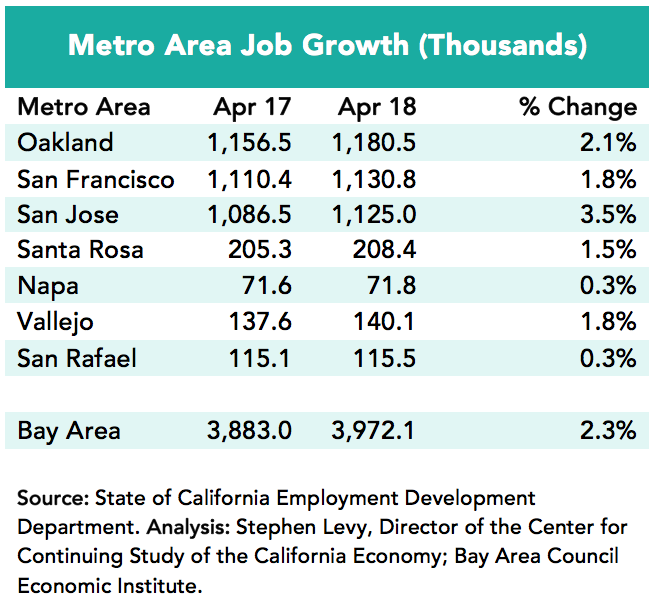 Job growth during the past year was led by the San Jose metro area with gains in the Oakland, San Francisco and Vallejo metro areas. 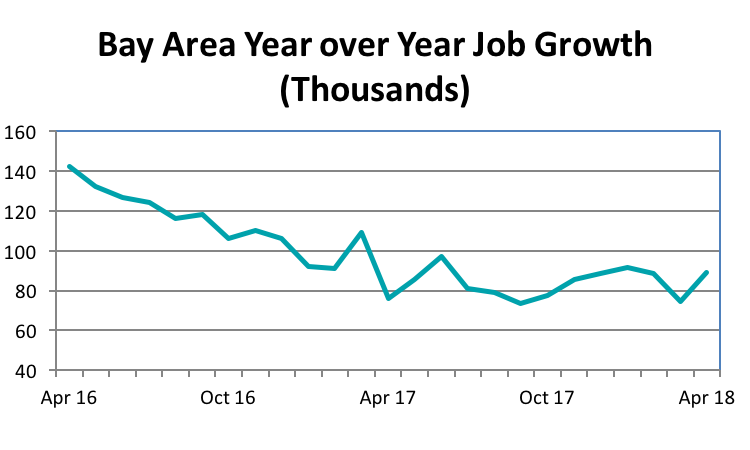 The San Jose metro area added 7,000 jobs in April to push the year over year gain to 3.5%. April 2018 continued the strong decline in Bay Area unemployment rates. The region wide unemployment rate fell to 2.5% compared to 4.2% in the state and 3.9% in the nation. The number of unemployed residents fell by 32,600 between April 2017 and 2018. These low unemployment rates combined with high housing costs pose challenges to firms trying to expand their workforce. Labor force growth slowed to a trickle during the past year though the surveys on which these data are based do not have a large sample size. 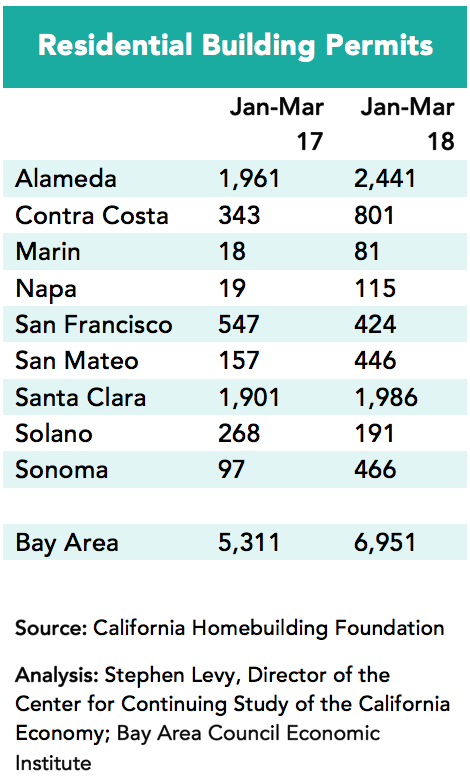 Housing permit levels continued the surge that began in 2017 with permit levels rising 30% in the first three months of 2018 led by strong gains in Alameda, Contra Costa and Sonoma counties. 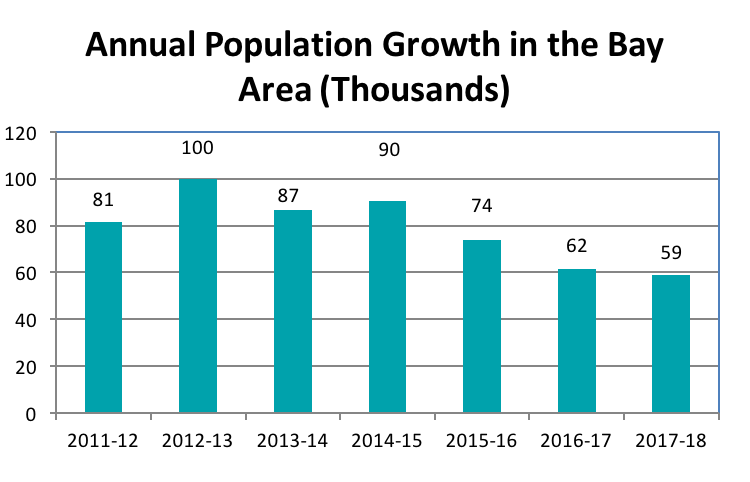 New population estimates for January 1, 2018 were released in May and show a gradual slowing in the number of new residents in the region. Yet companies are planning major expansions in the region. Just in the peninsula and south bay there are announcements nearly every week. Facebook just confirmed a million square foot lease in Sunnyvale on top of their Menlo Park expansion. Last week both Nvidia and Fortinet announced expansions on their existing sites. And every week there is a new lease, purchase or plan for added space in downtown San Jose. These expansion plans come at a time when the region is struggling to deal with the challenges of housing shortages and lack of affordability and increasing traffic delay. For the company expansion plans to become real (at least for most or all of them) will require housing for more workers on top of building for the existing shortages and increased mobility options to get workers to their jobs. Every week there is news of a new housing project in Oakland, San Francisco and San Jose. Plans for substantial housing in downtown San Jose are moving ahead along with plans for housing near Facebook and approvals are surging around the region. Still this housing upturn does not come close to addressing the large shortage built up much less fully keep pace with current growth. And not all permits eventually get built. 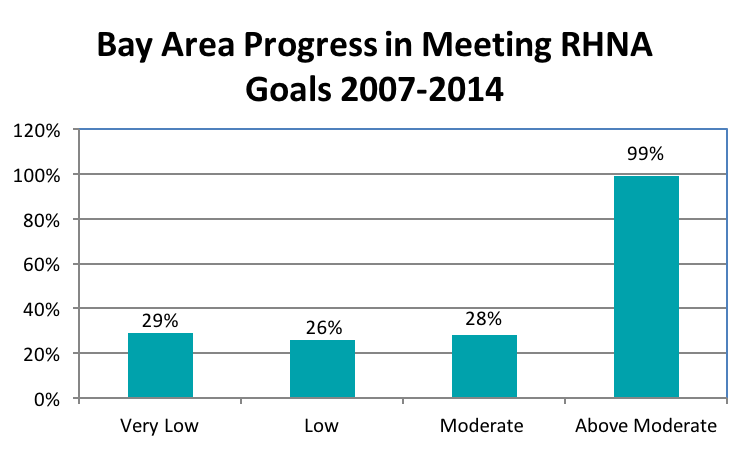 CASA is taking a close look at the missing middle including ideas like adding a new RHNA category for 120%-150% or 180% of area median income and a variety of ways to reduce the cost including modular construction, reducing parking requirements and fees and making it easier to build ADUs.